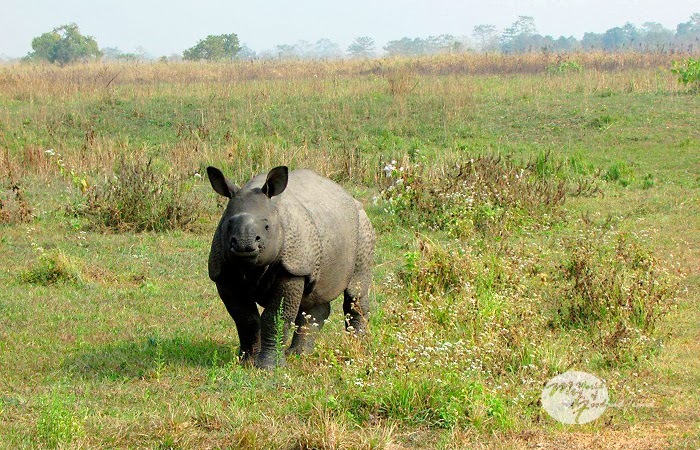 Manas Wildlife Sanctuary is a National Park, UNESCO Natural World Heritage site, a Project Tiger Reserve, an Elephant Reserve and a Biosphere Reserve in Assam. 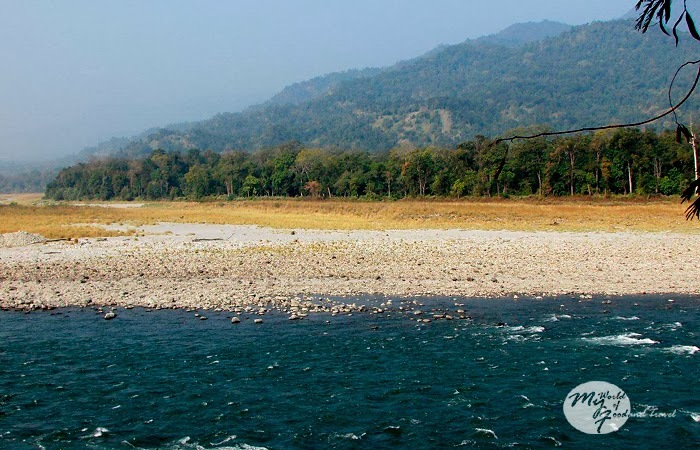 Located in the Himalayan foothills, it is contiguous with the Royal Manas National Park in Bhutan. In December 2013, I finally managed to set aside my fears and decided to visit Manas along with my parents and my aunt. Perhaps Deta (my father) had the same apprehensions, too, and it took us some time to persuade him. We set out early for Manas from Guwahati via Nalbari, with the mists still hanging low over golden yellow mustard fields. 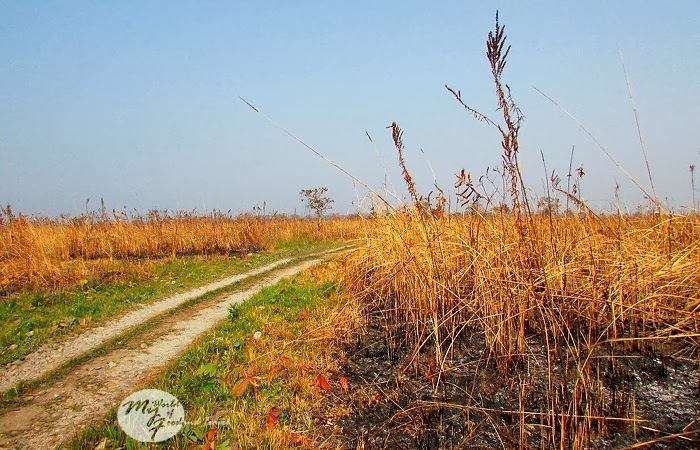 It was a somber journey, each lost in our thoughts, as we traversed the 150 km to Manas. I woke up with a start when Uncle G, our host and family friend, swerved his Scorpio towards a gate and announced that we had reached Manas. We were in Manas? But where’s Deta’s office? Where were the huge Sal trees? 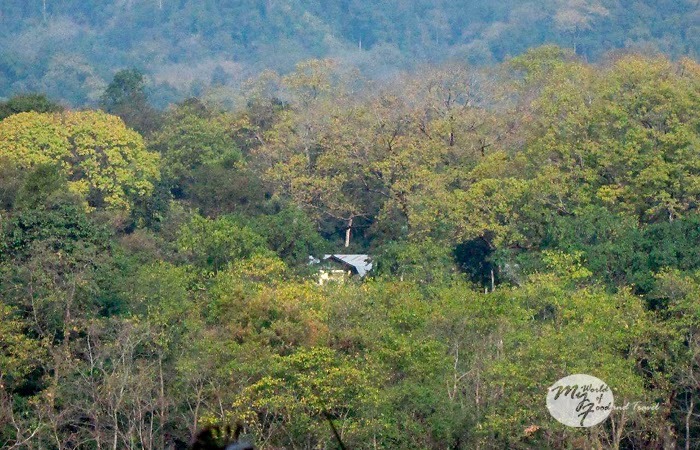 “We passed the office, and the trees are no more there,” Uncle told us matter-of-factly. It was evening by that time and we resorted to a night of sitting by the fire-side and recounting old memories. Next morning, I woke up excitedly at 5.30 am to see Manas in daylight. Alas, there was a thick veil of mist and we could not do anything but sit sipping tea. Finally at 9.30 am the sun broke in and we entered the jungle, passing through its gates. The same gates where, as kids, sis and I had stood waiting for the then King of Bhutan to drive through. He had waved back at us, one hand on the steering wheel of his swanky sports car. As the gates opened for us, it was with a palpitating heart that I sat in the vehicle. Would all my memories come tumbling down like a block of dominoes? Would I be crushed to see the change in Manas – whose memories I have been carrying with me all these 25 years? 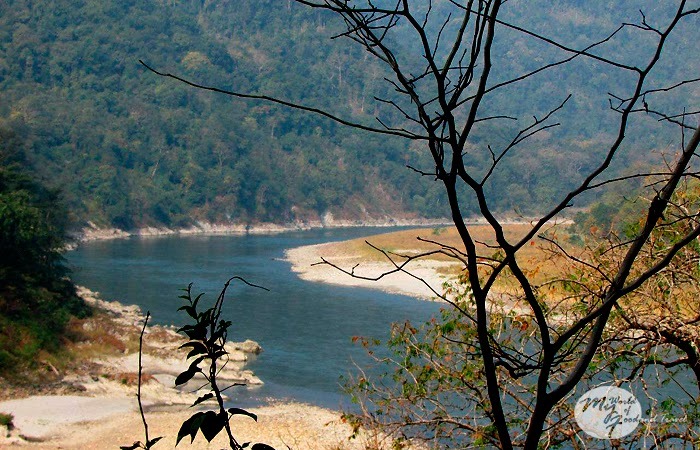 No, I took a deep breath after a few minutes, Manas is still beautiful. Yes, there were changes, vast changes. Habitats had changed, grasslands had been over taken by trees and climbers in many areas, animal sightings were sparse. 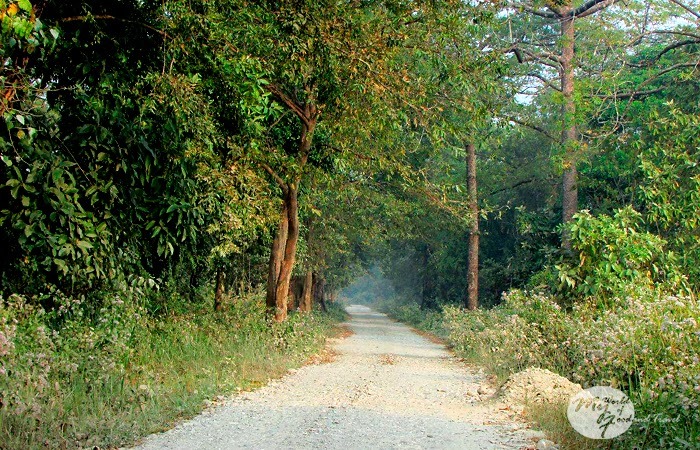 There were no Kanchan trees with their beautiful leaves bordering the road near the forest gate. But that is inevitable, isn’t it? 25 years is a long time, indeed. The deer were not there in Pohu Field (as known to us then). Their population has come down drastically over the years. For obvious reasons, which I would not want to elaborate. I remember the sea of twinkling lights, their eyes gleaming in the headlight of the Jeep, all those years back. A lone barking deer gives us its glimpse before darting away amidst the bushes. So does a wild buffalo. Asian Fairy Bluebirds and others thronged around the flowers and fruits of the trees. My camera is forgotten as I sat taking in the sights around me. After all, the camera could only capture the images of birds and animals – it won’t capture the essence. Deta sat quiet most of the time. Perhaps he, too, was taking time to get acquainted with the new Manas. He had joined Manas in 1970 as a young man and worked till 1988 as Range Officer – a span of 18 long years. He is one of those unknown, unsung faces who were responsible for taking Manas to its glory years in the ‘80s. He had built roads, anti-poaching camps and mapped out Manas. In all the 9 years that I stayed in Manas, I don’t remember sharing a single decent meal with him. He was always out patrolling the jungles with his men. Many a times he would sit for dinner and a wireless call would lead him to rush off in his Project Tiger jeep. I never saw him smile either, it was always his worry lined face that would peer at us in the wee hours of the morning when he returned home. In his years in Manas, Deta had crossed swords with many politicians and higher- ups in order to protect Manas, not bending the rules for anyone. He had evicted illegal settlers from jungle premises, rankling people with vested interests. No wonder he never received any formal appreciation or promotion during his long tenure. Deta is a bitter man today. Somewhere I discern that angst stemming from the fact that he never received recognition for all his hard work. Perhaps a little pat on the back would have helped. Also, with the present state of Indian wildlife where everyday a rhino is killed, he feels his work to conserve the forests has been in vain, a waste of time and life. 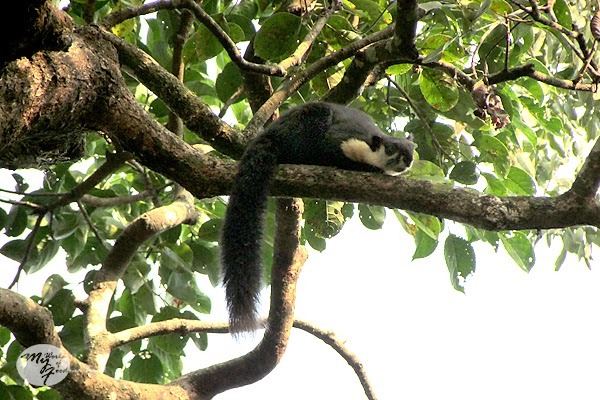 We halted by the road side to photograph the gentle Malayan Giant Squirrels. Already there were a few safari vehicles congregated at the spot. The accompanying guard told us that they had spotted a leopard some time back. No such luck befell us. But then, I was not there to see birds and animals particularly, like I did in other jungles. I had come only to meet Manas. 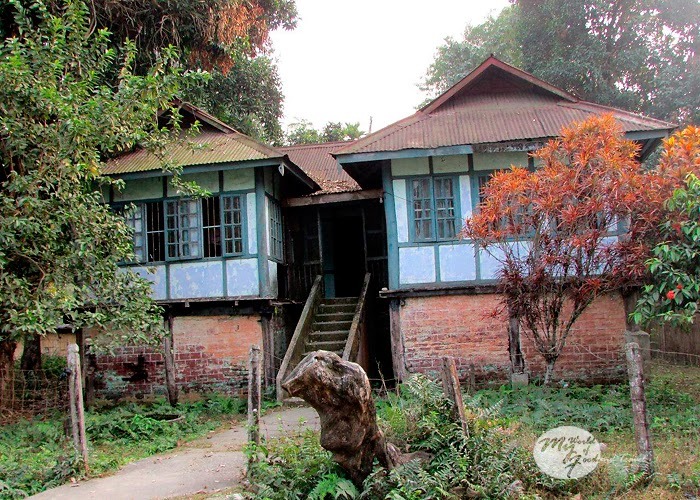 Mothanguri bungalow seemed a shadow of its former imposing self, although freshly painted. 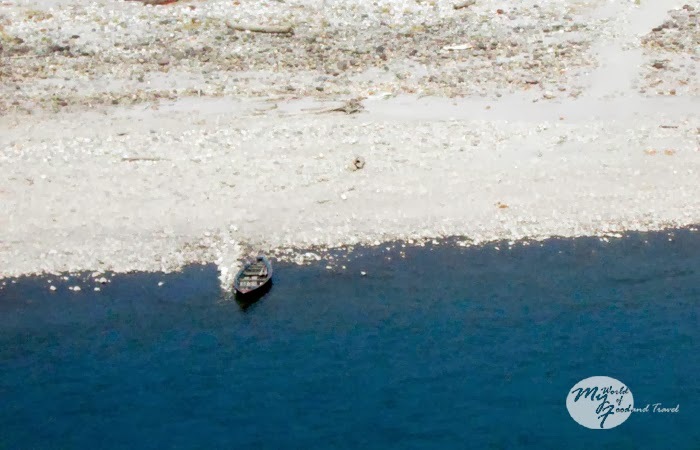 But it stood with pride, right in front of the flowing, shimmering, blue waters of the Manas river. The river with the white stones. I remember, as a child my pants pockets would always be full of these beautiful shiny white stones and when Ma shook it out, several of them would clatter down the floor. We took photographs there, in front of the bungalow, just as we had done many, many years ago, at the same spot. The only difference, between that old photograph and the new one, was the baby. In the old one, it was me, and in the new one, it was my son. We drove around the jungle, observing the new sights, making peace with ourselves. The sight of a baby rhino and its mother gladdened our hearts. 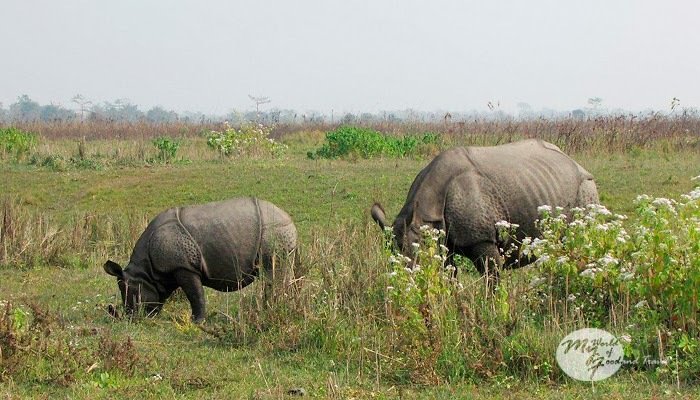 They were rehabilitated from Kaziranga, we learnt. Finally, we returned to our base and after lunch, decided to return to Guwahati. But Ma had a request to make. “I want to see our old bungalow,” she said quietly. “And I would want to pay my respects at the Kali temple,” Deta spoke unexpectedly. After all, he was chiefly responsible for establishing the temple there. 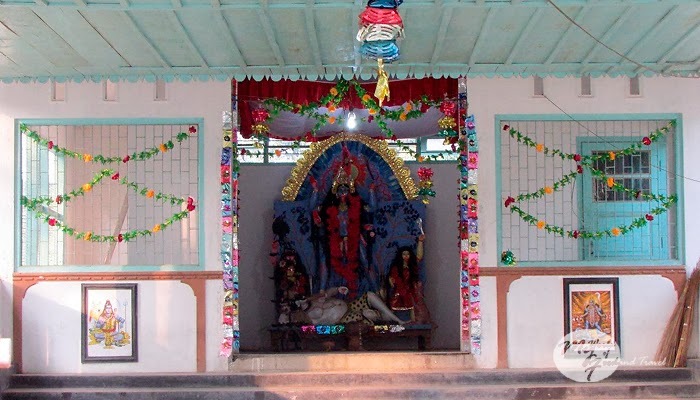 In my growing years Kali Puja was the most important festival for me. It was a big occasion and I would somewhat be intrigued by the sight of Deta dressed in a dhoti that day. For, he used to be the priest for the puja held in the temple. Uncle G drove us to the living quarters and Ma and I walked up to our old bungalow. What lay before us was heart rending. 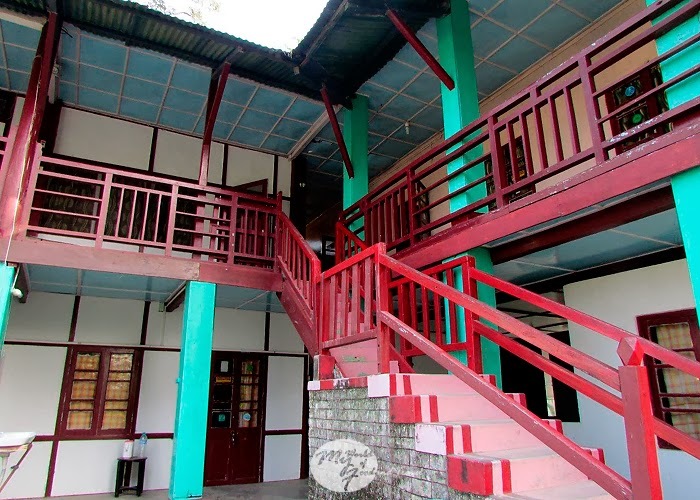 Our beautiful bungalow lay in shambles, resembling a haunted house – a bhoot bungalow. The tree at the front had been cut down, the garden had gone wild and the two small decorative ponds were not there. Of the bungalow itself, the doors and windows were falling apart. But the tall tree that stood near our bedroom was still there. It used to be a haven for imperial green pigeons. We braced ourselves and went around at the back to see the kitchen and our backyard. It was the same story there, too. Ma looked on misty eyed at her kitchen and the garden beyond that. She recalled how one day after marriage she had been picking peas in the kitchen garden when Deta arrived from office and gazed with wonder at Ma. Later he confessed that he was wondering who that girl was in his garden. My workaholic father had neatly forgotten that he was married! I then realized that it was not only Deta’s life that was written in the walls of our bungalow, it was Ma’s too. After all, she had spent 10 years in the jungle, away from the city life that she was used to, and brought up two daughters all by herself. During the day, I was amazed to hear her ask about old mahouts and forest guards. I never knew how much she was emerged in the daily life of these people who made up Manas. It must have been as tough a life for her as it was for Deta, engulfed by the insecurities of jungle life and Deta’s job. Ma had told me once about a notorious poacher who was caught by Deta and mercilessly punished. He had left in a police van screaming vengeance with “TUK SAI LOM! (I will see you)” at Deta. Ma had shivered hearing that, but Deta had laughed it off. A few years later, Ma and Deta were shopping in a market when they came face to face with the poacher, who had apparently been released. Ma was horror-stricken to see him there. The poacher had been shopping, too, and he was holding two heavy bags. For a moment, he stood staring at Deta. In the next instant he did something that neither Ma nor Deta had expected. He dropped the two bags with a thud and ran helter skelter amidst the crowds. “And there goes your avenger,” Deta had told Ma. We paid our respects at the Kali temple and were about to leave when a few people who had recognized Deta came forward. I had thought in 25 years nobody would be there to remember Deta. They informed the current Range Office of Deta’s presence and he invited us for tea in his office. The office compound reminded me of the terrible incident where Deta almost lost his life, as well as the feasts that took place there after the successful completion of a project. Deta would always hold a feast for his staff to appreciate their work with the leftover money from the project fund, and a little going from his own pocket as well. That day Amol Palekar was to arrive in Manas and people were in a tizzy to receive him. As we were about to bid good bye to Manas, I looked back at our old bungalow, silhouetted against the dying rays of the setting sun. 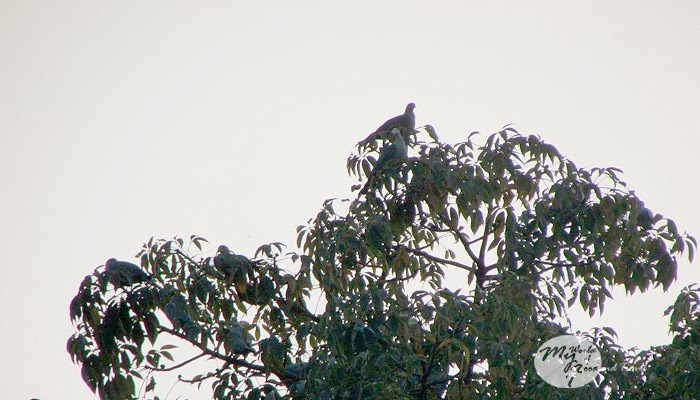 Scores of imperial green pigeons were flying overhead, and to my amazement they settled down on the tall tree adjacent to our bungalow – their old roost. Finally, I left with peace in my heart. 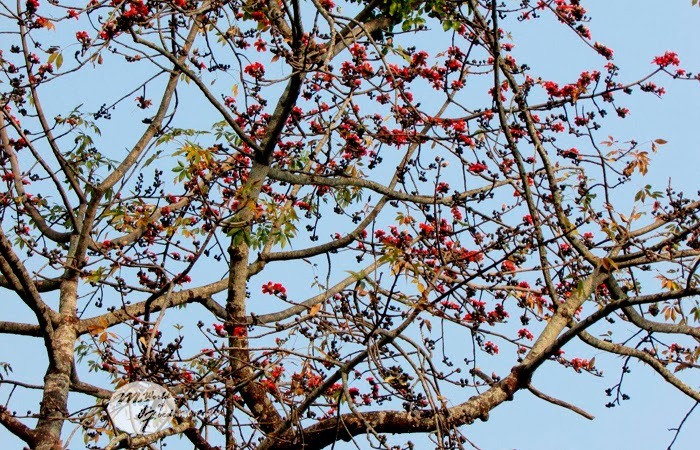 Although Manas had changed, and our old home was empty, yet the birds had stayed. Maybe some things had not changed in 25 years, after all. Great review of the place! Great sights framed along the way! The way you write, your vivid descriptions, all your nostalgic experiences... I felt living and seeing these with you...and I felt sad n hopeful with you...So lovely! Thank you so much, Jyothi! I am so irregular with my posts, I hope I don't disappoint you! came over from aditi's place to say hello. what a beautiful place to view, but i am sorry that your bungalow was in ruins. it must have been bittersweet. your mother sounds like a strong woman. blessings to you. Thanks for your beautiful words...yes, those were really bittersweet moments...but then, at least the bungalow was standing, it would have saddened me more to see a concrete structure in its place. Sangeeta, I too passed a reasonable time in this national park. My husband was the key person in monitoring the rhinos that were translocated to it. Just like your mother, I was a new bride who just started a new life when my husband was away in jungle working to save the legacy that your father left behind. Thank you so much Puspanjalee. I am at a loss of words to find someone who had lived in the same jungle as I had. I have utmost respect for your husband who worked in the rhino translocation project. And I am sure you can write a book on your experiences as a new bride in a national park - that life is just incomparable!